Nope, it seems that the word balsamico means "restorative" or "curative" in Italian (can anyone confirm that? ), and in my experience, that could certainly be an apt definition. Sniffing the straight vinegar will clear your sinuses right out, and eating anything drizzled with a balsamic reduction will quickly and effectively improve my day, however dreary it may be. Because of that, I keep a squeeze bottle of balsamic reduction on hand and find myself adding it to lots of things, whether the recipes list it as an ingredient or not. This particular recipe, however, does call for it, and it's an awesome component. The other pieces are pretty fantastic too--herb-coated chicken, melted mozzarella, garden-fresh tomatoes, and lovely, verdant basil join forces to create an incredible meal that comes together easily and tastes amazing. To make the balsamic reduction, add balsamic vinegar and brown sugar to a small saucepan over medium heat. Bring to a slight boil and reduce by half, about 6-8 minutes; set aside and let cool. If it's too thick, add a little more vinegar and melt it in. In a small bowl, combine olive oil, basil and oregano; season with salt and pepper, to taste; slather onto the chicken. Melt butter in a large oven-proof skillet over medium high heat. Add chicken and sear both sides until golden brown, about 2-3 minutes per side. Place into oven and roast until the chicken is completely cooked through, reaching an internal temperature of 160 degrees F, about 15-20 minutes, depending on the thickness of the breasts. Top each chicken with mozzarella cheese, then broil for 2-3 minutes or until the cheese has melted completely. Serve immediately, topped with sliced tomatoes, drizzled with balsamic reduction, and garnished with basil. *As I'm wont to do, I bought one of the cheapest bottles of balsamic vinegar at my grocery store. By sheer coincidence, America's Test Kitchen did a taste test of supermarket balsamic vinegar not long after that, and the bottle I got was actually recommended! Balsamic reduction and I are best friends lately. It just makes everything taste better! I love balsamic vinegar and this dish is simply marvellous! This looks delicious, Grace! A lovely summer meal with fresh tomatoes and basil. A fantastic summer dish, Grace. I love balsamic reduction. The balsamic drizzled over the dish looks so good! These are flavors that are meant to be together. I'll be honest, balsamic is one of those things that I just can't be ok with. There's something about the smell that freaks me out (I know it's weird). But because this dish looks so great, maybe it's worth a second try...? That's a great looking chicken dinner. I have balsamic vinegar but have not used it much; maybe I should try something along these lines. I should have known better than to read your blog before lunch, I'm craving this now!! 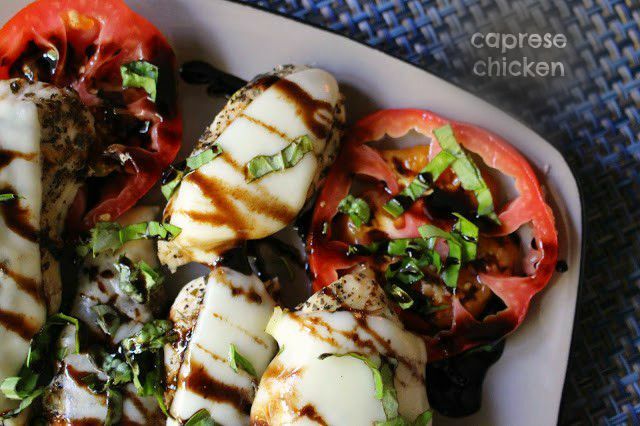 Grace, your Caprese Chicken sounds and looks really good! Balsamic works for me, love the aroma and taste. Great recipe! I'm a big fan of using balsamic vinegar any time I can. Your reduction sounds like a perfect adornment for this chicken. Your post came at the right time for me. I'm running out of the balsamic reduction I bring back from Germany. Your chicken looks delicious. Very summery dish packed with veggie flavors and of course balsamico adds that special touch I love!